Trail camera photos can help you figure out big bucks feeding patterns. Well it looks like the big bucks are coming along just fine. 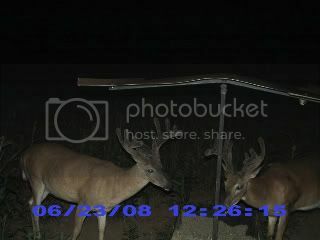 I received an email of some trail camera photos at our club. It looks like the supplemental feeding and food plots are providing good nutrition for the deer. There are some really good shots of some trophy bucks. It looks like these two big bucks are eating good! This is one of my best trail camera photos. It looks like a full moon! This buck is showing off for the camera! 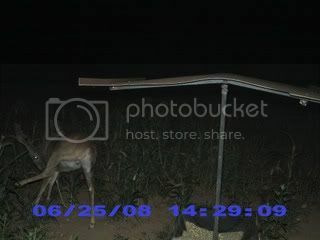 I got this trail camera picture of this buck feeding during daylight hours. This is Rosco a big buck that is very elusive. 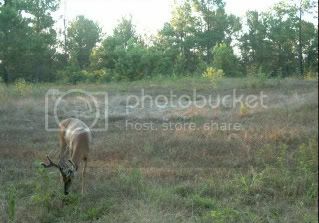 These are some real good shots of some mature whitetail bucks. It looks like it is going to be a good upcoming season. I can’t wait to get out and get after some of these great bucks. Do you use trail cameras to scout your deer hunting property for trophy bucks? Have you got some good shots of big bucks this summer? Aren’t trail cameras a great tool for helping us deer hunters figuring out mature whitetail bucks? I think it is so cool to see hunters get trail camera photos of big bucks and then harvest that buck by using the photos to pattern the buck and figure him out. Have you ever used trail camera photos to help you pattern and harvest a trophy buck? If you have some trail camera photos you would like me to put on here send them to me and I’ll gladly do it. It wont be long until deer season is here. I am already fired up about it! How about you? 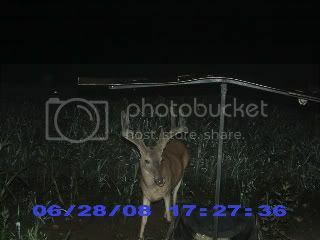 Tagged trail camera photos. Bookmark the permalink. Thank you for stopping by Cory! I am ready for deer season. I know that for sure. I’ve only had one buck on trail cam that was as big as any of those in your pics. Hopefully I can shoot him sometime this year. That would be cool. I hope you get a big one this year Arthur. I am ready for deer season too. Looks like you have a good season ahead of you with some good looking bucks too. A lot of hunters from all over North America tell me that they see more deer than last year. I have read several blogs this week that posted some really good trail cam pictures. This is a great way to get hunters pumped for deer season. Thanks for sharing the pics! Thanks Jeff! I hope I do too! Hey Kris, I would glady give you a link. Thanks for visiting, good luck with your new endeavor. Nice capture, pictures taken were pretty clear even at night. Details were perfect. Some cameras don’t have this kind of quality.